SINGLE TICKETS: Thur.-$22, Fri.-$27, Sat.-$28, Sun.-$25 - Active Military, Student & Senior Discount & Great Group Rates. November 21, 1963: On the eve of their deployment to a small but growing conflict in Southeast Asia, three young Marines set out for one final boys’ night of debauchery, partying and maybe a little trouble. The men must compete in the “proud” Marine tradition of the “dogfight”, a high-stakes contest to see who can pick up the ugliest date. But when Corporal Eddie Birdlace meets Rose, an awkward and idealistic waitress he enlists to win a cruel bet with his fellow recruits, she rewrites the rules of the game and teaches him the power of compassion. 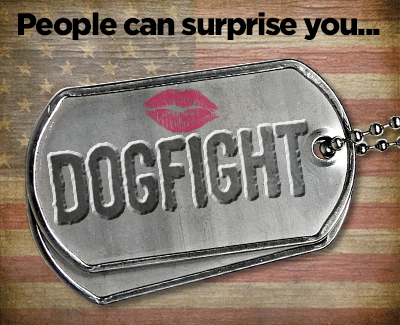 Dogfight, a romantic and comic musical adaptation of the 1991 movie with River Phoenix and Lili Taylor, wowed audiences when it premiered at New York’s Second Stage in 2012. Winner of the Lucille Lortel Award for Best Musical in 2013, it offers audiences an unexpectedly tender and genuine love affair supported by an impressive and beautiful score. Since Dogfight, the inspiring writing team that is Benj Pasek and Justin Paul (called “heirs to Rodgers and Hammerstein” by Variety) have gone on to achieve great acclaim with more stage musicals, TV and film scores, most notably the Tony Award-winning Dear Evan Hansen, Smash, and the Oscar-winning La La Land and The Greatest Showman. Press images are not yet available for this production. Friday, July 26, 2019 at 6:30 p.m. Celebrate open nights at Coronado Playhouse! You’re a loyal supporter of The Community’s Theatre and we want to show our appreciation. Playhouse members are invited to a hosted Happy Hour at CPH for drinks and appetizers before every opening night of each new main-stage production. Mingle with fellow theatre lovers and enjoy the ambience and excitement of opening night. Not a member? Not a problem! Membership starts at just $50 and can be purchased in advance or at the event.